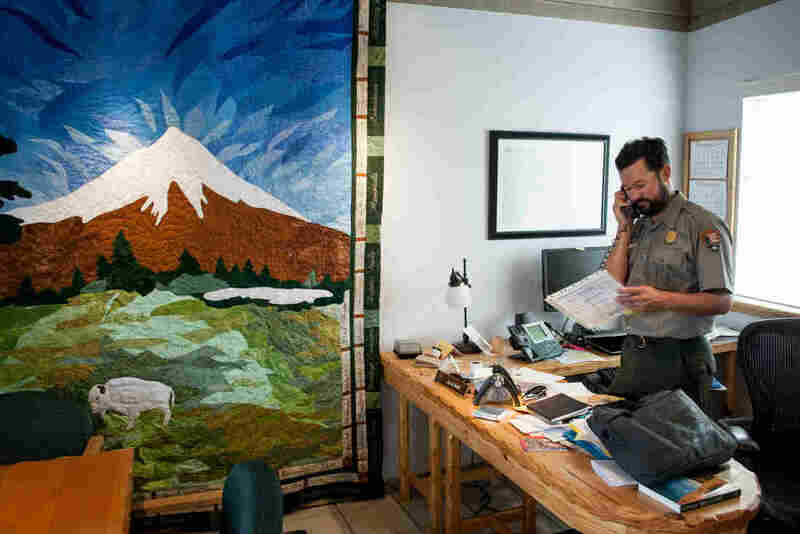 National Parks Have A Long To-Do List But Can't Cover The Repair Costs Parks are expensive for obvious reasons: Visitor centers need displays, and roads need repairs. But there's also upkeep of the Grand Canyon's sewage operations and of Independence Hall's sprinklers. 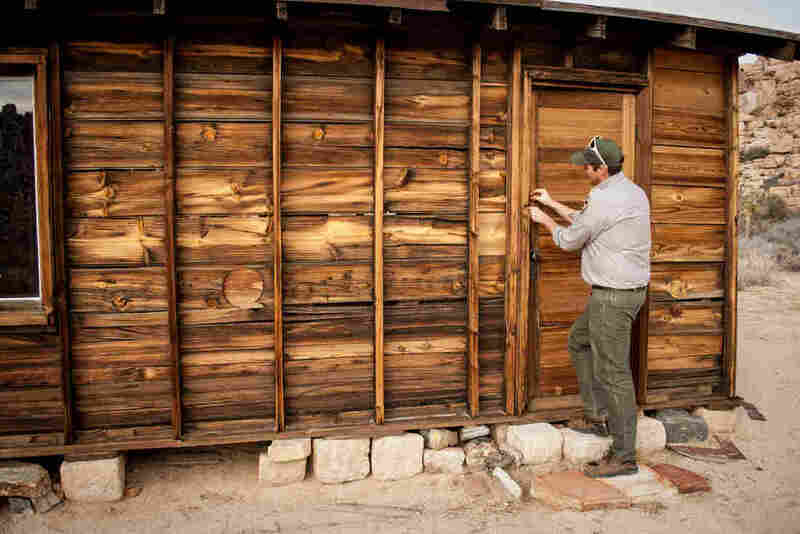 Theuer's job is to preserve and maintain some of the historical structures here-- sites like Keys Ranch, the sprawling high-desert homestead deep in Joshua Tree's interior. The ranch's schoolhouse, which is about 80 years old, looks like it was cobbled together with salvaged materials. There are no studs keeping the walls straight and upright, so now there's as much light pouring in through the warped wooden-plank walls as there is through the windows. "We came in and added all of these supports here," Theuer says, pointing to a beefy frame built up against the building's interior. Without it, it's hard to imagine the building standing up to a good sneeze. The wooden frame and the expertise to install it were expensive, Theuer says. To keep buildings like this standing and to keep them as historically accurate as possible requires structural and architectural analyses, historical preservationists and period experts as well as raw materials and construction crews. In total, Theuer estimates the annual cost of keeping this schoolhouse standing is $35,000 to $40,000. The schoolhouse is one of a number of structures at Keys Ranch. There's a two-story house, a guesthouse, a work shed, a windmill, tractors and wagons — all of which need upkeep. I need about twice as much money as I currently get to address our maintenance backlog. So how much does it cost to maintain and preserve Keys Ranch for visitors? It's hard to say exactly — and it really doesn't matter, Theuer says, "because that money doesn't exist in the National Park Service." Joshua Tree National Park is so expensive to maintain that for years, the park's management has had to put off big projects because it hasn't had the money to take them on. "Here at Joshua Tree, we have about $60 million in backlog maintenance," says David Smith, the park's superintendent. "And to put that in perspective, our annual operating budget at this park is a little over $6 million." Entrance fees and donations from local groups bring in millions of dollars more, but Smith says it's nowhere near what's needed to start chipping away at that backlog. And the longer it takes to address some of those issues, the more expensive they're going to get. Roads are a big part of that backlog. Many of the park's roads were built almost a century ago when the area was still being drilled and mined for gold. "Now we have bus-size RVs and SUVs driving on them. It tears them up," Smith says. Given time, a crack in a road can become a pothole; potholes can lead to washed-out roads during the next flash flood. "As a homeowner, you take care of your house," Smith says. You clean out the gutters and maintain the pipes. "If you don't take care of your house, it falls apart." 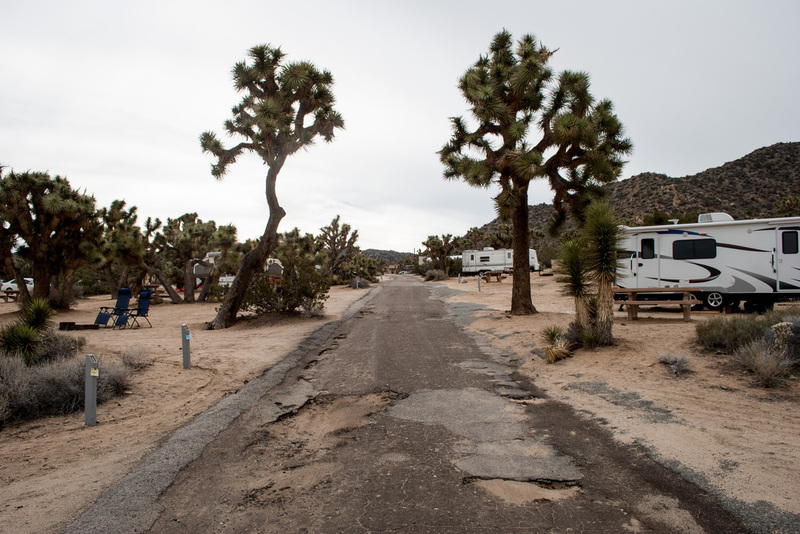 Flooding and the combined traffic of thousands of cars, trucks and RVs have torn up the roads at Joshua Tree National Park's Black Rock Canyon Campground. The majority of the park's $60 million maintenance backlog is for roads like this. Then there's the visitor center at the south end of the park, which sees tens of thousands of tourists a year. It's a double-wide trailer; it sits on top of a fault line and isn't properly fitted. "The fault goes right under my office," Smith says. There's also the fact that despite having a record 2 million visitors last year, Joshua Tree didn't have the money to hire more rangers, janitors or emergency rescuers to help them out. "I was just listening to the radio, and we have volunteers responding to an incident at a high point in the park because we don't have staff to respond to that incident," he says. The net result, Smith says, is that "we don't have enough money to provide the level of service the public expects." Joshua Tree National Park, like most of the 409 areas managed by the National Park Service, gets the bulk of its money from Congress. It's appropriated year by year, and in recent years usually comes to about $3 billion annually. Entrance fees, philanthropy and concession sales bring in more money to the park system, but National Park Service Director Jon Jarvis says it's not enough. That much money may have covered the tab for the park system years ago, but not anymore. When the money's tight, some jobs don't get done — and those jobs start to pile up. Today, the total backlog of needed maintenance at U.S. national parks is $11.9 billion. That backlog includes $500 million in needed repairs at Yosemite National Park, $100 million of which is considered critical. Grand Canyon National Park needs $330 million, due largely to outstanding wastewater and water system upgrades. The Blue Ridge Parkway, which saw a record 15 million visitors last year, needs $478 million to help address the wear and tear from all of those drivers. "I need about twice as much money as I currently get to address our maintenance backlog," Jarvis says. He's hopeful that Congress will hear his plight and appropriate more money to the National Park Service, pointing out that the new five-year highway transportation bill includes $1.4 billion for roads and bridges in national parks and that President Obama is asking Congress to appropriate more money, using the Park Service's centennial as a reason. That highway money won't come close to addressing the need, though, and Obama's proposals have been met with resistance, leading people like Holly Fretwell, a research fellow at the Property and Environment Research Center and an economics professor at Montana State University, to say that people need to be realistic about the funding situation. "There's no way that Congress is going to appropriate enough funding to make up this total deferred maintenance backlog," she says. They don't have an additional $3 billion to give, she says, and the national parks aren't that big of a priority. Fretwell says the current and traditional system of funding the national parks is broken. "We have to do something different," Fretwell says. "There's no question, because we are losing the quality of our national parks." Fretwell has a few ideas. One is to limit the expansion of the National Park Service. It's not popular with those who want to see more areas protected and preserved, but Fretwell says it doesn't make sense for the Park Service to bring in more sites and areas when it can't maintain what it already has. Expansions are "thinning the blood" of the park system, says James Ridenour, a former director of the National Park Service, because they take needed funds away from some parks and distribute them to others. Fretwell says another idea is to look more seriously at public-private partnerships, where the Park Service still owns the land and sets the rules but a private company or entrepreneur runs the day-to-day operations. "They are a firm, they are a business, they generate profits, and their goal is to manage for a good-quality product like a firm somewhere else," she says. Most of Arizona's state parks are managed by a private company called Recreation Resource Management. Tallgrass Prairie National Preserve in Kansas is owned by the National Park Service but jointly managed and funded by The Nature Conservancy. Still, Fretwell says she knows that people are uncomfortable with the idea of a private company running the national parks. She hears it from her own friends: It's going to turn into Disneyland. They're going to charge us $1,000 a day. Fretwell says that wouldn't be the case, because the National Park Service would still set the rules and because putting a roller coaster in Yellowstone National Park wouldn't be good business. That's not why millions of people visit. It's not a perfect solution to the funding issue, Fretwell says, but it's unlikely that a cure-all solution exists. It'll likely be a mix of appropriations, fees, endowments, sponsorships and public-private partnerships.